I like love to bake. I bake even when I don’t plan on eating what I bake. 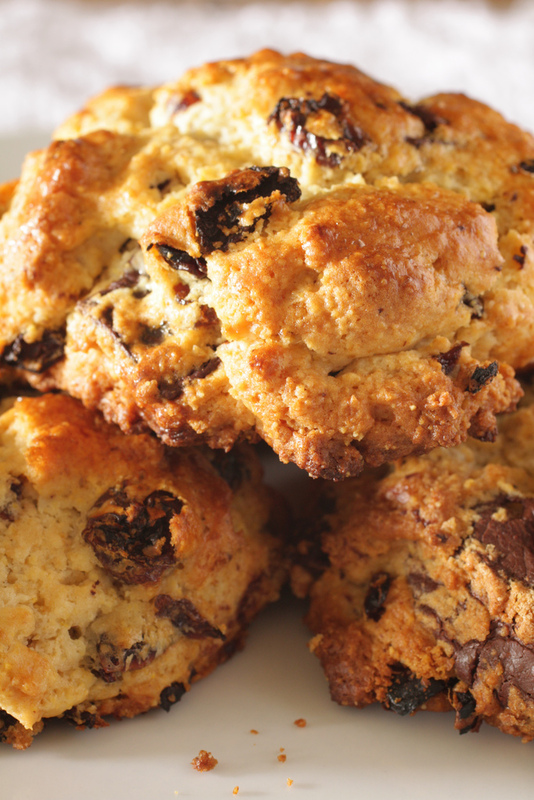 If I can’t sleep at night, I whip up a batch of cookies, or a bunch of scones – something quick, something easy. That’s pretty much how I came about making these scones. The many hours of daylight has messed with my system. Also, I’ve discovered that I have bundles of energy when I don’t eat grains or sugar. The result? I don’t need much sleep anymore. So why not make some? Combine flours, cornmeal, sugar, baking powder, and salt in the bowl of a food processor. Pulse once or twice to combine. Add cubed butter and pulse a few times until the butter is the size of peas. Whisk together milk/cream, egg, and almond extract in a liquid measuring cup. Add mixture to flours and stir until just combined. Add chocolate chunks and cherries, fold until combined. 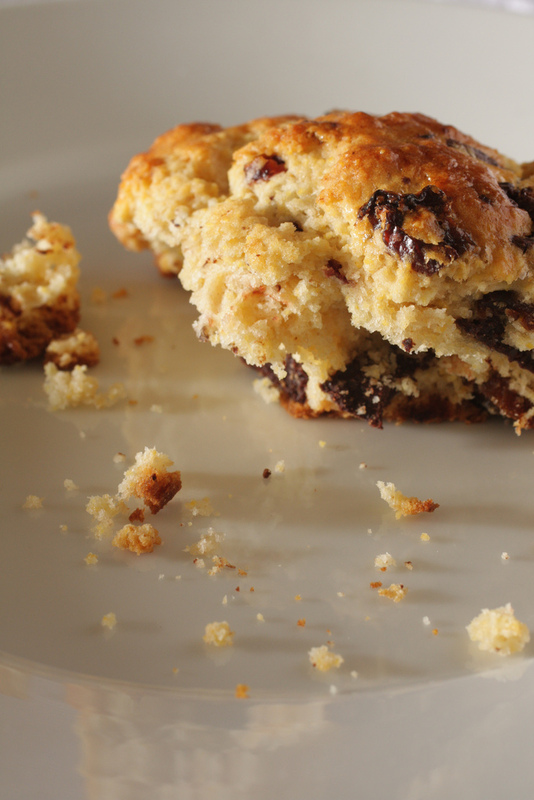 Using an ice cream scoop, form 8 scones onto parchment or silpat lined baking sheet. 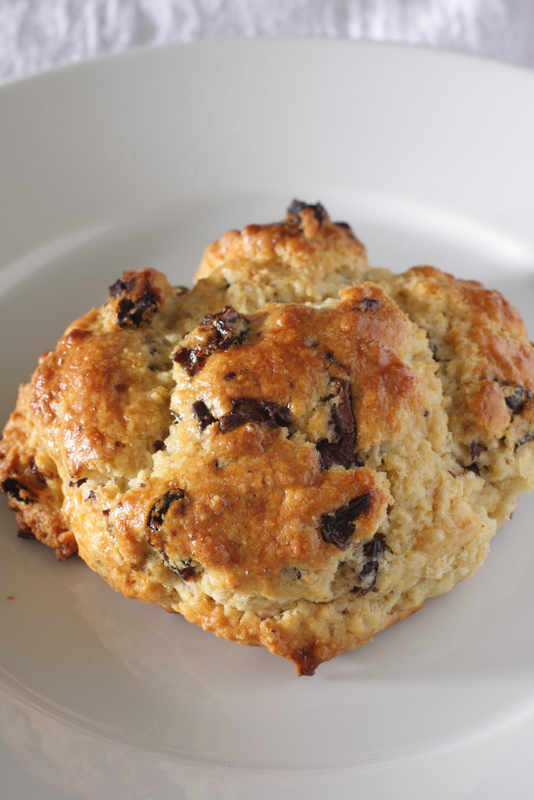 Brush the top of each scone with egg wash.
Bake for 20-25 minutes, or until the top is golden. These scones sound terrific. I love the chocolate/cherry combo. Dontcha feel like there is never enough time in the day to complete the recipes you want to?? So frustrating.